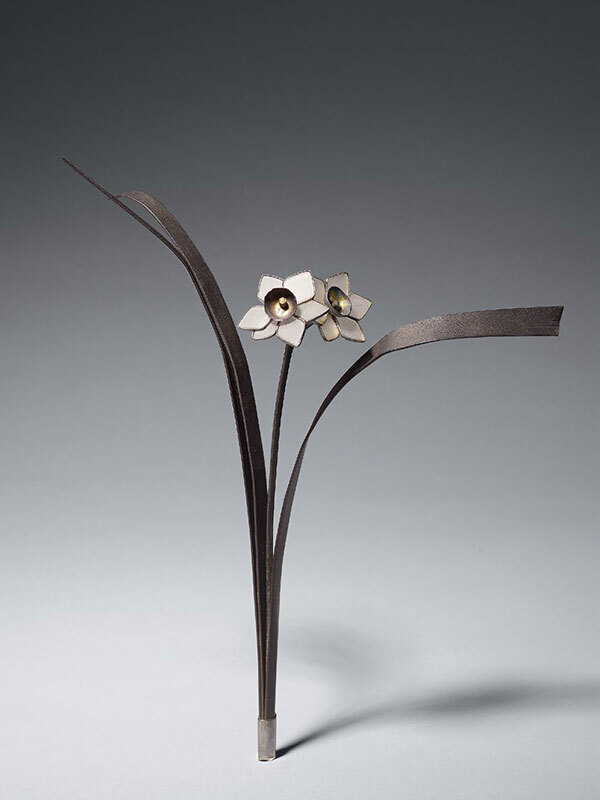 A bronze and glass okimono of a flower, the stalks and leaves in metal, the pointed flower petals in glass. Contained within the original tomobako, inscribed Hanamon tokokazari. Heian Nagamitsu. Nagamitsu [Flower (suisen = narcissus shaped) display item, Nagamitsu (Choko), Kyoto, with the seal Nagamitsu (Choko)]. Imaoji Nagamitsu was a Kyoto artist. The term okimono in Japanese literally means “object for placement [on display]”. Small sculptures of leaves and flowers were popular in Japan at this time; an iron and hardstone okimono of a wild vine, made in 1927 by Senroku Kithara and now in a private Japanese collection, was included in the 1996 touring exhibition Craft Movements in Japan 1920s – 1945. There is a paperweight in the shape of bells made by the same metal maker.